video | A . T . T . N ! Forget the headset. If your computer doesn’t have a built-in camera and microphone, buy a webcam that does both. Keep it short. If you have a lot to say (and sometimes we do! ), chunk up the message. Make a video mini-series with 5-10 minute chapters. Prepare well and then wing it. Sometimes a brief outline taped next to your webcam is all you need to stay on track without sounding like you’re reading from your notes. Position the camera above your eyes, so you look slightly up at it. Position your head to appear at the top third of the screen so the recording includes your face and most of your torso. Location, location, location. Your work or home office are usually safe choices as a background for the recording. Move it out. Don’t always shoot your videos from the same spot. Your audience will tire of seeing the same background.Keep the backgrounds neutral but varied. Your audience will appreciate it. Look right at the camera lens. Looking anywhere else looks weird. Your audience will think you have an avoidance problem. Cover your screen. Once you get everything ready, consider taping a piece of paper over your computer screen so you’re not distracted by seeing yourself while you record. Remember, you do not need to be perfect! Try not to be overly critical of yourself. Say “cheese.” Smiling helps everything. Whether you’re recording a webcast of your face or just your voice, smiling makes you look and sound better. Avoid over doing it. The wacky music, goofy fade-ins, and spinning transitions that come with some video editing software can make home-videos look corny. Leave most of those tools for the professionals (who don’t really use them either). Visual context-to-detail balance is the control of how often your video editing tool is zooming in and zooming out. Some video tools, such as Camtasia’s Smart Focus, allow the software to make these decisions for you, based on the movement of your on-screen cursor, but the top-end instructional designer will always want to control location and magnification precisely and, therefore, manually. Today we call this framing and it is supported by David Ausubel’s classic Advance Organizer model. Having a sneak preview graphic at the front-end and a review graphic at the back-end of a step-wise training segment is often a fine idea. Mediaspace is a nifty solution for using multimedia in your in class or online courses. It is very easy to put stuff from your media to D2L. You simply log in (here) with your star ID and password. Many faculty members get frustrated with putting up an audio Power Point in their D2L course. The issues are: students cannot view them while in D2L, they have to download the PPT first. Then, many faculty do not want their PPTs downloaded so they would just upload the PDF version of their PPT to their course. This way, the idea of having a voice over Power Point is lost, and you have to settle with what works best for you. However, using Screen Recording tool in Mediaspace Kaltura enables you to select the specific area on your screen to record and use the mic along the way. You can record your Power Point and have the audio with it, then just upload it in your D2L course. The cool thing about it – students can view it (and hear the audio) straight from the course and cannot download it. Bellow are step-by-step instructions of how to do a Webcam Recording or Screen Recording and then embed the video in a Content Module. For additional help and FAQs click here. Once you log in, you will see your name in the upper right corner. Next to it, to the left, you will see Add New, with the drop down menu. You can select Screen Recording or Webcam Recording (as you can see there are 3 more options, but I will cover the basic two now). 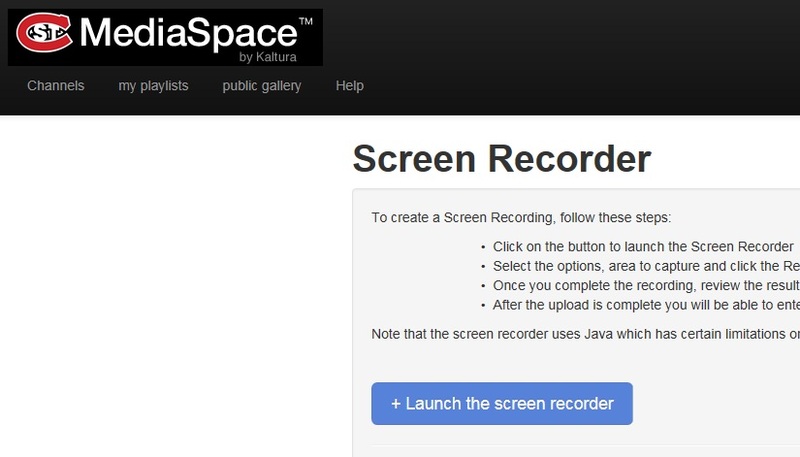 Once you click, you will be prompted to Launch the Screen Recorder or if it is just a video – you will be asked to “Record from Webcam” where you click “Allow Camera and Microphone Access” on the screen. Next, you start recording. In Screen recording you control the pause button and once you are ready, click done. 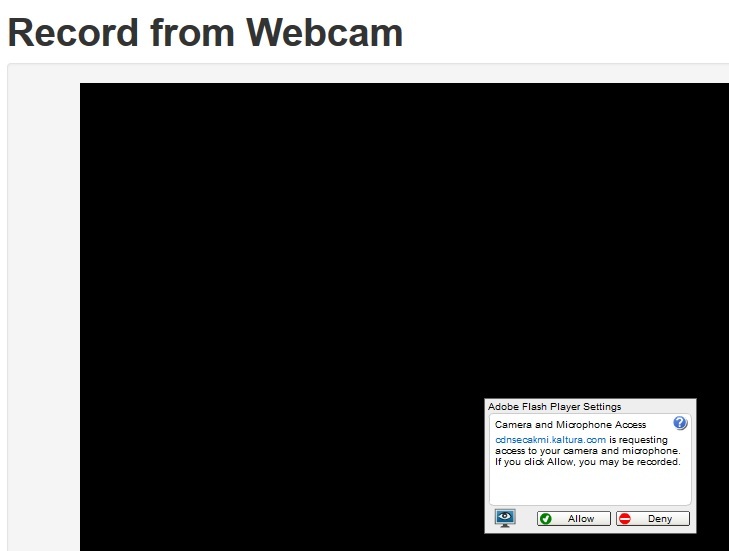 In Webcam recording, you just click anywhere to start recording and then click anywhere on the screen to stop recording. You will see a box with “Save” appear on the screen. It is very important to Save on the screen, as that is how the video is uploaded to your media. 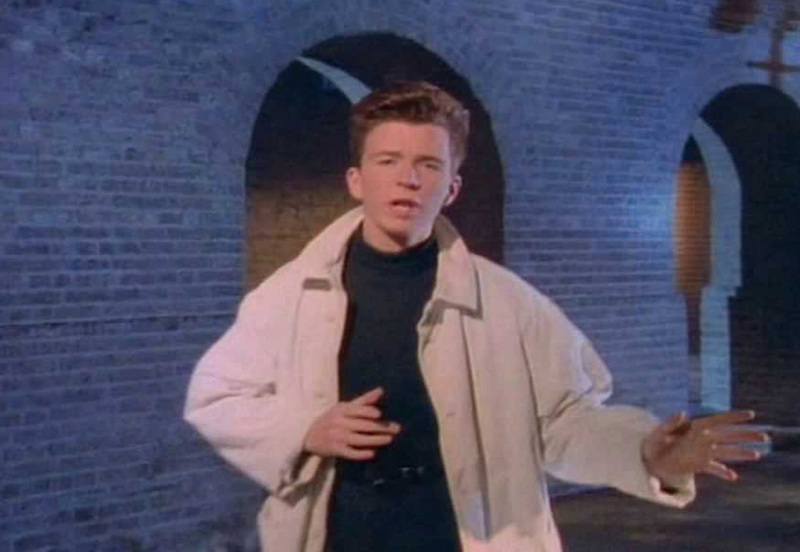 Then, Name the video. You can also add a Description for your students. The most important thing is to always save it as Unlisted! Why – if it is Private, you will not be able to share it with anyone. If it is Published, anyone can see it right away. Therefore, always click Unlisted and then click on the blue save button below. Once it is saved, you get the option Go to Media. You will click Go to Media and it will take you to the newly recorded video/screen capture. From there, you will click Share. 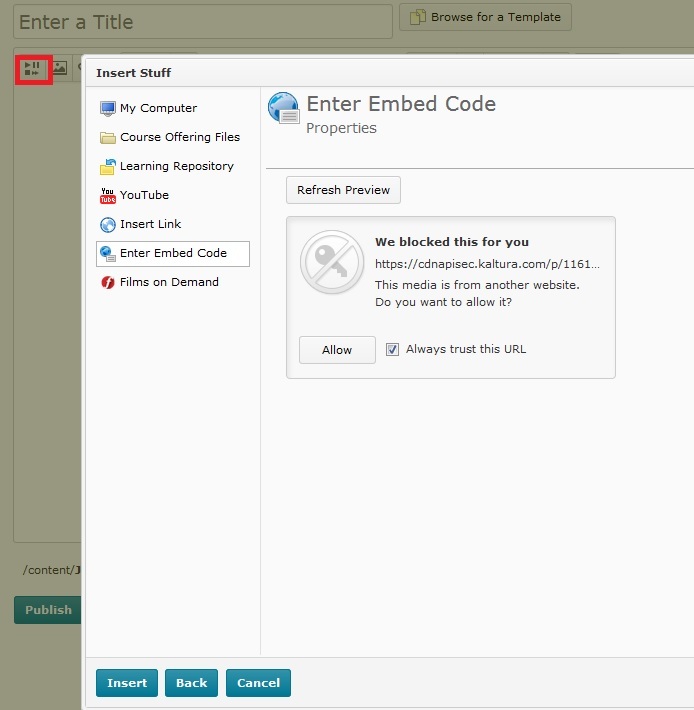 You want to be able to get the embed code and share it with your students in your D2L Brightspace course shell. 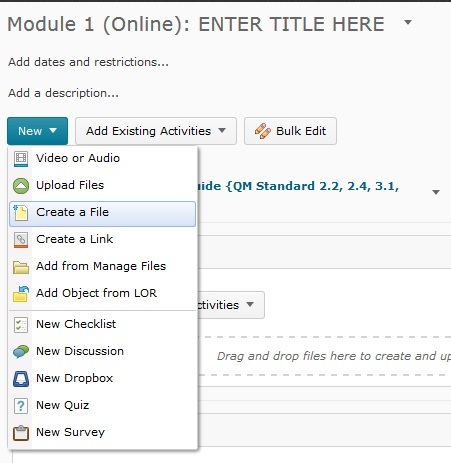 Have your D2L course open in a new tab/new window next to it. 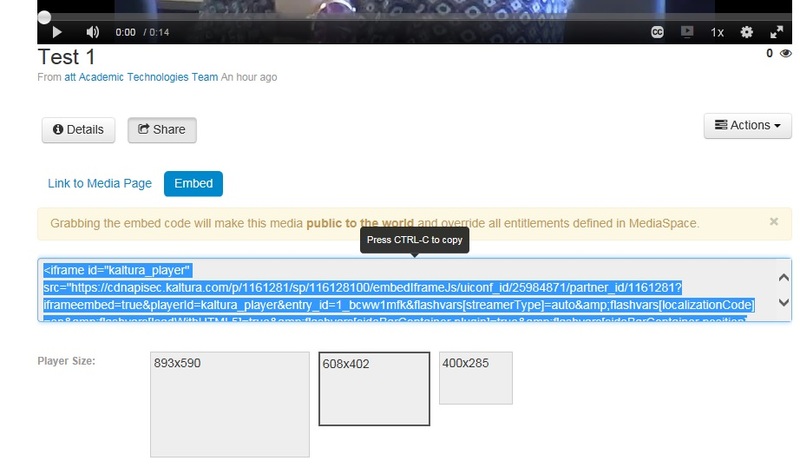 Once you click Embed, you will get an embed code in a window and all you need to do is copy it (right click or ctrl-c). Now that you have copied the embed code, open your D2L course. In Materials > Content > (any selected) Module > New > Create a File. Once you click Create a File: Enter a Title > (**Below the Title box there are options: The first icon in the upper left corner says Insert Stuff**) > Click Insert Stuff > Enter Embed Code > Paste!!! what you copied in Mediaspace – your embed code > Next > Allow > Insert. 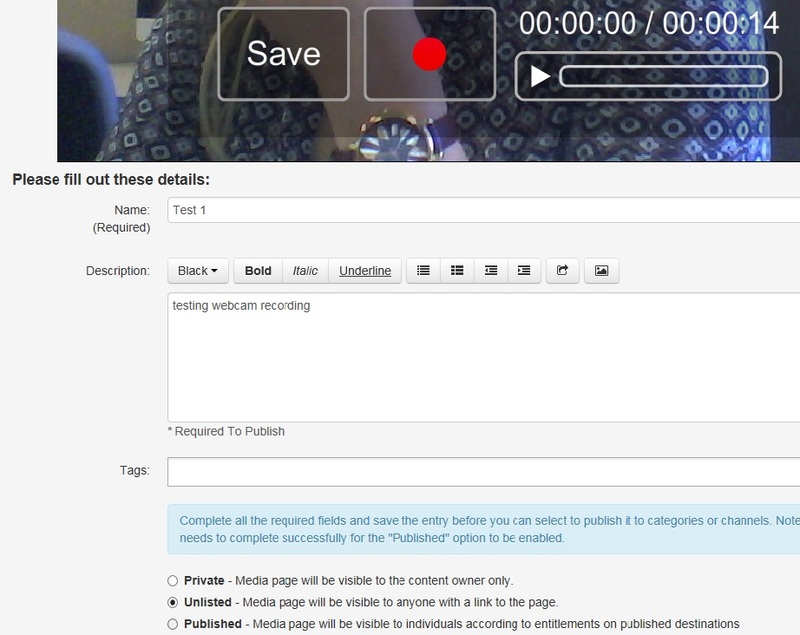 Voila, you have inserted the video in your D2L content page. Don’t forget to publish the newly created file. We hope this post can help you navigate these resources. Again, if you have any trouble getting through the steps, we are here to help! Contact us here, by email att@stcloudstate.edu or just walk in to Miller Center 118. What Makes an Online Instructional Video Compelling? We encourage the use of different instructional materials for your face-to-face, hybrid, or online courses. 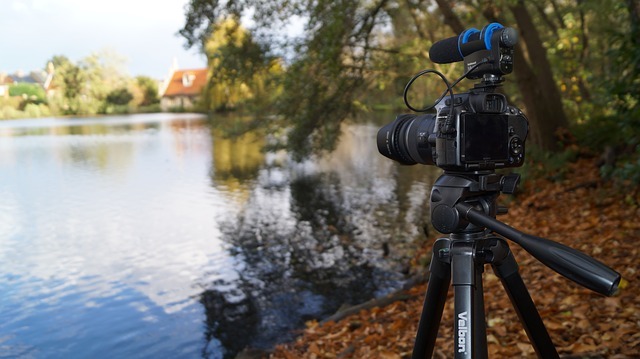 Videos are a big part of classes nowadays, but it may be hard to decide on how to integrate videos in your course or how to create professional quality videos of your own. Let us know if you plan to post videos for your course and schedule a consultation for best practices/video help. Stop by our ofice: Academic Technologies Team is here all summer, Miller Center 118. Thursday, October 8 is Fall break for our students. However, Center for Excellence in Teaching and Learning at SCSU organizes the Faculty Workshop Day. This year’s sessions are on student retention and success. Among many excellent presentations that will discuss this year’s topic, online and distance education are certainly a setting to be taken into account. “Sense of Community Theory is based on the work of Seymour Sarason (1974). Sarason’s research explored community identity and social bonding. In the online environment, where students are physically separated from one another, the strength of the learning community depends on the extent to which students feel like insiders rather than outsiders. 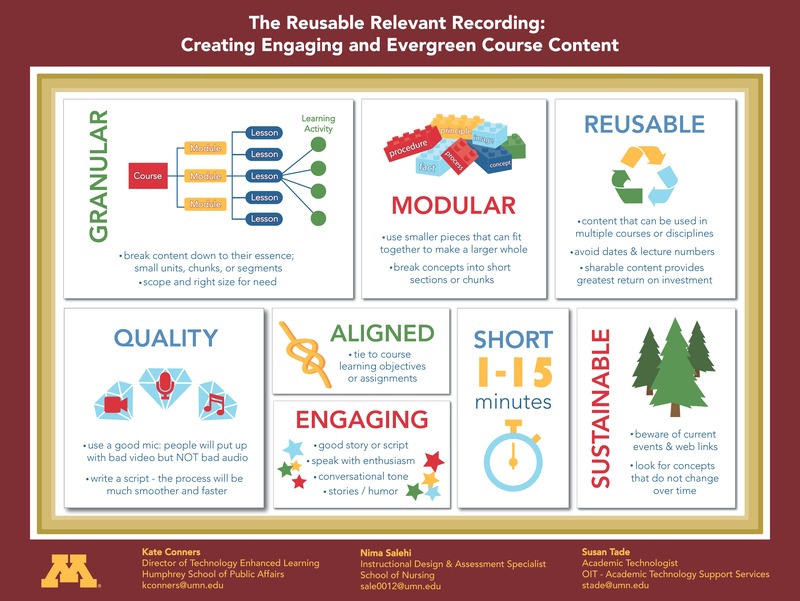 Until then, here is an article in the Chronicle of Higher Education that focuses specifically on building community in an online class by doing student video presentations. Please refer your students to their D2L/Brightspace home page that will show the academic support services for them or Tutoring Services/Options. This leads our students to the listing of all SCSU on-campus tutoring services and Smarthinking. Smarthinking is a 24/7 online and on-demand tutoring service, available at no charge to all enrolled students (each student is assigned 15 hours per semester by default). They can use Smarthinking to schedule live tutoring appointments, participate in drop-in live sessions, ask questions, or submit writing assignments for feedback. Students are able to access the Smarthinking website via a link on their D2L/Brightspace main page. Finally, just below this new resource, remind them that there is a list of free self-registration offerings as well as student help documents and student overview videos for navigating D2L. How Does a Video Go Viral?